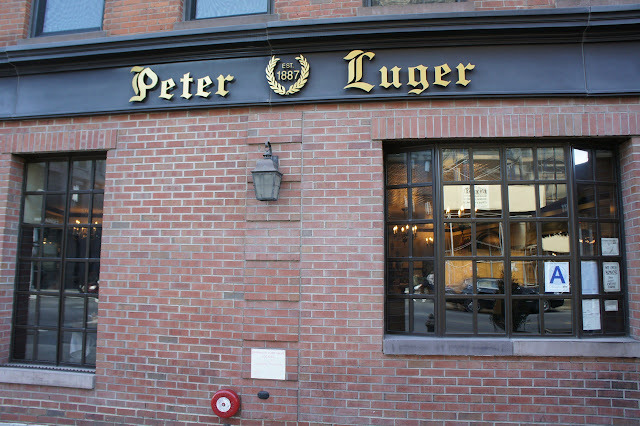 Peter Luger is a New York institution, having been around for over a century and is arguably the most famous steakhouse in the City. 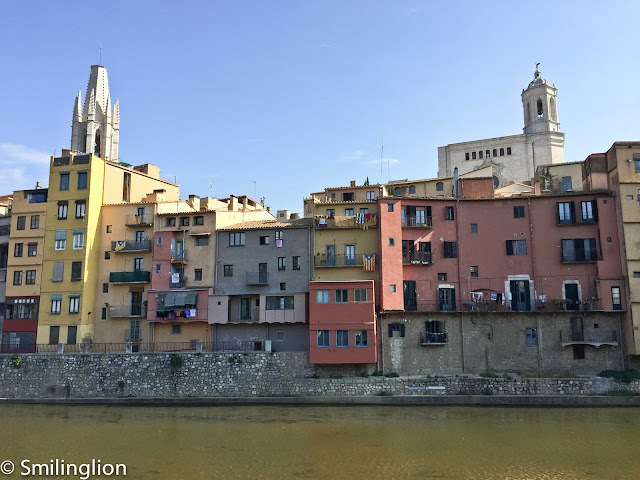 It has one Michelin star, which says more about its standing in New York than its ability to meet all the criteria normal for a Michelin-starred restaurant. 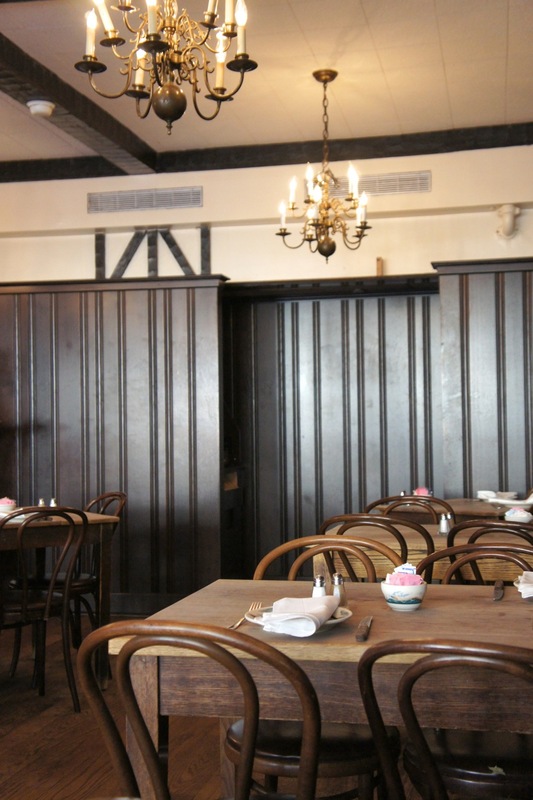 Located in Brooklyn just across the Williamsburg bridge from Manhattan, it has a traditionally adorned interior reminiscent of a German beer hall. Despite their menu having a variety of food like burgers, fish, pot roast etc, there's really only one thing we wanted to try: their aged porterhouse prime beef steak. 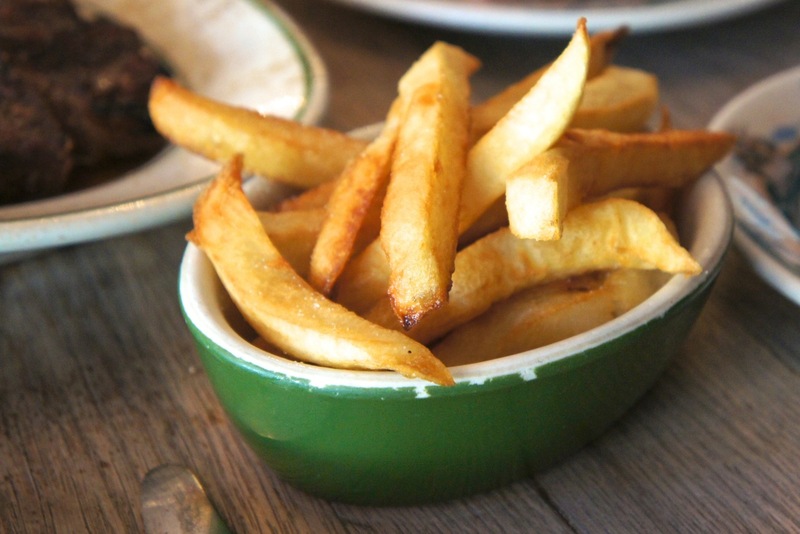 It comes in sizes of 'for one, two, three or four' and is served still sizzling on the plate. 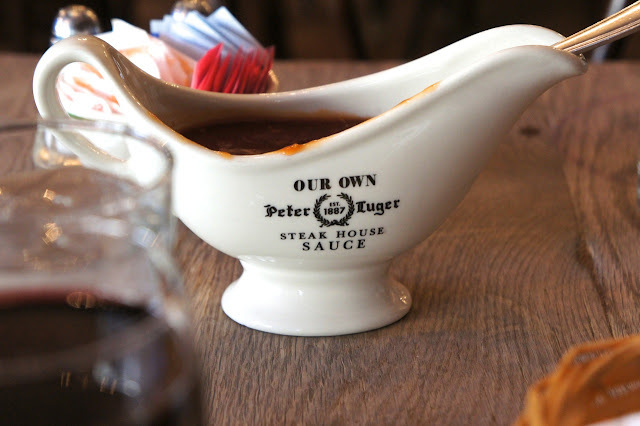 Peter Luger is quite proud of their special sauce (which can be bought in supermarkets), it was good, but was good with the breads and too sweet for the steak (good steak never needs sauce anyway). When served, our porterhouse was pre-cut into smaller pieces with the meat on the bone left on the place in case we want to gnaw at the bones. The steak? 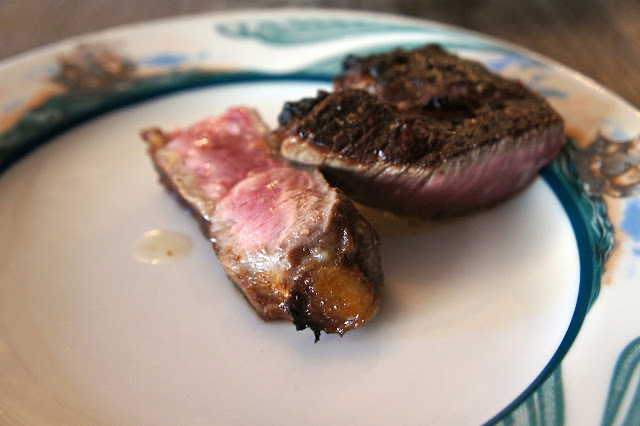 Amazing flavourful and juicy, with the right marbling (did not taste too fatty) and grilled to perfection. 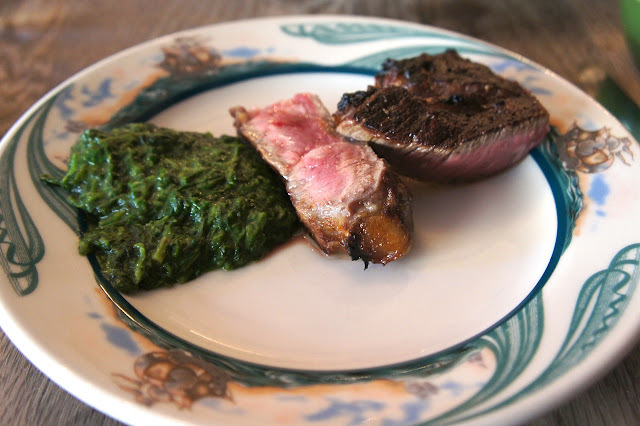 In addition, the side order of creamed spinach was amazing as well, and the vegetable was neither too bitter nor buttery which is the flaw of this served elsewhere. Golden brown fries were very good as well, although we were saving our stomachs to finish to steak and largely left the fries untouched. Final Thoughts: Memorable steak lunch, we really enjoyed the sides as well. Best steakhouse? Hard to say, but it was darn good nonetheless. Service was good that day despite some reviews which suggest otherwise sometimes, but it could have been because we were there at 1130am on a Monday and the restaurant wasn't full. 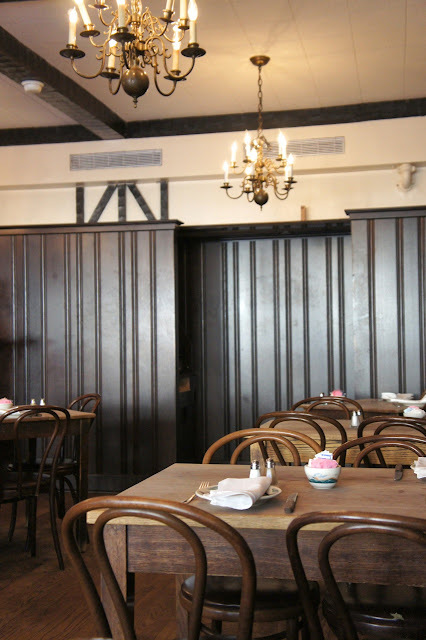 In some ways, Peter Luger reminded us of another favourite beef steak place of ours in Italy, Da Sostanza, in that when we were there the focus was purely on the food and the ambience, service and interior decor becomes a distant secondary consideration. 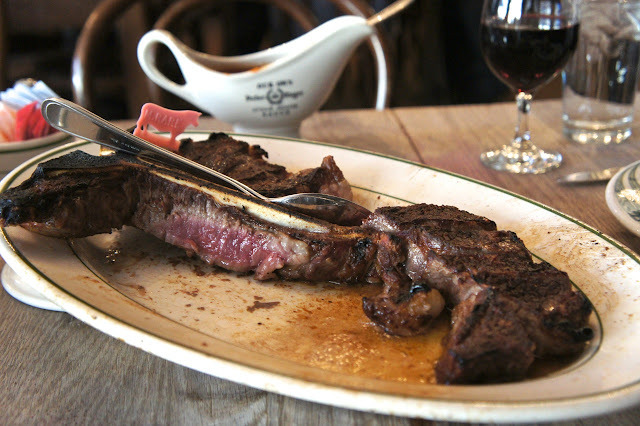 If compared with the other steakhouse in New York we ate at a few days before, Quality Meats, we'd say that Peter Luger's steak shaded it as the flavour was more intense, but Quality Meats had the better variety of other foods/wines in the menu and a much cooler vibe.